Bully Boy Distillers became Boston’s first craft distillery when it launched in 2010. Co-founded by brothers Dave and Will Willis, who grew up on a farm in Sherborn, Massachusetts, the business unites their lifelong passions for craftsmanship, distillation (beginning with farm cider) and entrepreneurism. Much has changed in the industry since the distillery opened. I recently caught up with Will Willis (above, left) to talk about Bully Boy and the state of craft spirits. Kyle Swartz: The craft industry received a boost last year with the first ever reduction in the federal excise tax. How has that helped you? Will Willis: We were thrilled, and pleasantly surprised. We put those savings into our payroll, hiring more salespeople. Obviously as a small business you don’t always want to be increasing your payroll. But with the nature of our business being so competitive, the more folks we can put out onto the streets in sales, the louder our voice can be. KS: How do you stand out today amidst that competition? WW: You need to evolve beyond the core four of whiskey, vodka, gin and rum. Nine years ago when we first opened it was enough just to have the core four; you stood out just by the virtue of being a craft distillery. Today, you need more than that. You need to innovate. You need to have excellence in what you’re making. As the term ‘craft’ becomes more marketable, and there’s a ood of products claiming to be craft, there’s naturally a watering down of quality. To stand out, you need to have su- perior products and to explore different categories. You need to bring unique ideas to the table. KS: How has Bully Boy done that? WW: We’re working on gins with different botanicals. We’ve got early tests going on an amaro. We’re working on whiskeys with different mash bills. We’re about a year into that. KS: The watered-down quality often includes new distilleries releasing whiskeys too young. Is this a concern of yours? WW: It can be frustrating. Being a small distillery, we can get lumped in with those newer distilleries with younger whiskeys. But because we’re confident in the quality of our stuff, it can also be an opportunity. If you can be excellent, you can stand out. But it is frustrating when you’re trying to enter new markets. With all the low-quality stuff, you have to work extra hard to differentiate yourself in the minds of consumers. 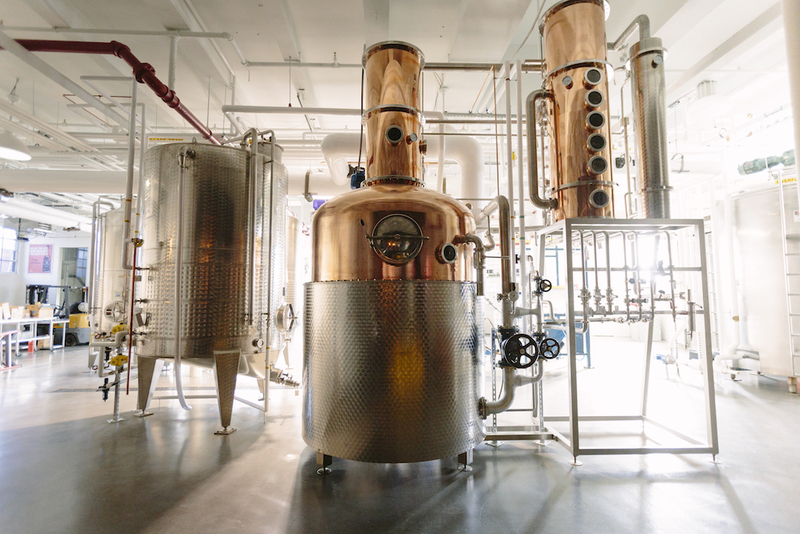 Bully Boy Distillers became Boston’s first craft distillery when it launched in 2010. KS: What are some trends you see? WW: I see distilleries taking more risks, trying to make something more niche. Distilleries are obviously going to make or break it based on mainstream spirits like whiskey, but taking risks is a great way to add creative credibility to the industry. Consumers are more educated now and more willing to accept risks. Eight years ago, it was enough for them to buy rum made in Boston. That was as risky as consumers would go. Now instead of asking for our Boston rum, they ask us about the newest thing Bully Boy has made. And that’s great. KS: What’s the future of craft spirits? WW: I think there’ll be a continued focus on sourcing ingredients as locally as you can. As the playing field becomes more crowded, there’s a greater need to protect your own backyard. The way you do that is by having the message that not only are you a locally made brand, you’re also locally sourced. I’ve seen brands with regional and national aspirations instead focusing more on their backyard. Part of that reason is what’s happening now in the beer industry. They tend to be five or six years ahead of ours. And that’s certainly what’s happening there now: a movement more towards local. Kyle Swartz is managing editor of Beverage Dynamics magazine. Reach him at kswartz@epgmediallc.com or on Twitter @kswartzz. Read his recent piece Dogfish Head’s Sam Calagione on Craft Beer’s Struggles and Future Growth.